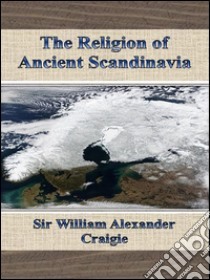 The native religion of the ancient Scandinavians was in its main features only a special form of that common to all the Germanic peoples, and this again was only a particular development of primitive beliefs and practices characteristic of the whole Aryan race. It is impossible to say how far back in time the special Germanic and Scandinavian developments of this religion may go, and of their earlier stages we have absolutely no knowledge beyond what may be doubtfully reached by the methods of comparison and inference. Even of the later stages our information is much more scanty than might be expected. Among the Goths, the southern Germans, and the Anglo-Saxons in Britain, paganism gave way to Christianity at so early a period, that very few details relating to it have been recorded by the civil or religious historians of these peoples; they were indeed more inclined to suppress than perpetuate any lingering knowledge of this kind. The absence of such information is a great bar to the proper understanding of many points in Scandinavian religion, which, instead of being thus illuminated from without, has continually been forced to throw light on the heathen worship of the other Teutonic peoples.